First, I do recommend Global Inequality: A New Approach for the Age of Globalization. Its scope is much more cosmopolitan and historical, and more orientated toward poverty and economic development, than other recent books on inequality. But you can turn to the fine reviews by Duncan Green, Martin Wolf, and Francisco Ferreira for information about the book. Or watch Milanovic’s own book presentation, which is also followed by fantastic commentary from Suresh Naidu. I myself, having a quarrelsome and disputatious nature, prefer to dwell on Milanovic’s ‘endogenisation’ of the Great War that I strongly disagree with. I’ve always wanted a pretext to argue against it. But it gets little attention either amongst economic historians, or in the huge Great War historiography, because few people think the idea is valid. Even Piketty made only a passing reference to it. I argue that the outbreak of World War I and thus the reduction of inequality subsequent to that war are to be “endogenized” in the economic conditions predating the war, by which I mean that domestic inequalities played an important role in the run-up to the war. In making this argument I go back to an older, and in my opinion, most persuasive, interpretation of the outbreak of World War I. According to this interpretation the war was caused by imperialist competition, embedded in the domestic economic conditions of the time: very high income and wealth inequality, high savings of the upper classes, insufficient domestic aggregate demand, and the need of capitalists to find profitable uses for surplus savings outside their own country. This “competitive struggle for markets” led to the exploitation of the colonies. 38 Economic success required creating colonies, protectorates, or dependencies, and introducing what Paul Bairoch has called the colonial contract. The colonial contract was defined by the following elements: colonies could trade only with the metropolis, with goods transported on the metropolis’s ships, and colonies could not produce manufactured goods (Bairoch 1997, 2: 665– 669; see also Milanovic 2002b). The scramble for colonies in Africa was fueled by the interests of European capitalists (see Wesseling 1996) A similar, almost equally brutal, scramble for new territories took place in Siberia, where Russia expanded eastward, and in the Americas, where the United States expanded westward to annex Mexican territories and southward to reinforce political control. Ghana, Sudan, Vietnam, Algeria, the Philippines, California, and Siberia are all part of the same process. The Great War….was caused by much deeper structural factors, among which domestic “mal-distribution of consuming power” is perhaps the most important. 41 To be quite clear, because it is an important point: the malign forces that broke the first Kuznets cycle and set the rich world’s inequality on its downward path for the next seventy years were contained in the unsustainably high domestic inequality that existed before. Maybe it’s kind of pointless to debate the causes of a one-off event like the Great War, but you can certainly say what theories do not fit the facts. And I’ve never thought the Hobson-Lenin imperialism thesis made much sense, on its face. Why do you need “surplus savings” for colonialism and imperialism? The United States of today, which many consider the imperialist par excellence, has been a net capital importer since circa 1980. In the 19th century, Spain, Portugal, Turkey, Russia, the USA (until ~1896), Japan, and Italy were all net capital importers, and all either had empires or had just embarked on major colonial acquisitions. Russia and the USA, as mentioned by Milanovic above, had recently brought a big fraction of the world’s acreage under their rule. IF foreign investment did require colonies and imperialism, weren’t large gross flows enough? You can have zero “surplus savings” but still have huge gross outflows of capital. So I don’t see why there is even in principle a link between inequality and imperialism. But that’s a minor point. What’s more interesting are the flaws in all the intermediate links between inequality and imperialism in the Hobson-Lenin thesis. Does the ‘maldistribution’ of income explain European capital exports ? Bairoch’s “colonial diktat” is exaggerated. Did imperialism lead to war in Europe ? Does income ‘maldistribution’ explain European capital exports? In the half century prior to the First World War, several European countries were large net exporters of capital, but the proper adjective for Britain is massive. Nearly a third of Britain’s net national wealth in 1913 was held outside the country. At its peak, almost half of Britain’s annual savings were invested abroad, implying close to 7% of British national income. By comparison the second and third places, France and Germany, were stragglers. Hobson attributed these capital exports to the “surplus savings” of the elites and, by implication, the ‘underconsumption’ of the masses. Lenin adopted a similar argument, but with a small difference (which becomes relevant later). Yes, all else equal, lower inequality => more aggregate consumption, assuming that the lower strata of the income distribution have a higher marginal propensity to consume than the upper strata. In The General Theory, Keynes criticised Hobson for equating savings with investment. [Edit: Thanks to Jo Michell: “Keynes criticises Hobson for for assuming S *causes* I”.] But Hobson was talking about a structural, or long-run, insufficiency of demand which would have been fairly insensitive to the interest rate. And I can believe that in the early 20th century there was a lot of latent demand constrained primarily by income. Nutritional surveys conducted in the UK in the early 20th century suggested “ten percent of the population consumed a diet which was inadequate in all respects, while a further forty percent consumed a diet which was deficient in proteins, vitamins, and minerals; only one person in ten enjoyed a diet which was adequate in all respects” [Floud 2011]. So, yes, it’s possible Britain before the war suffered from a kind of secular stagnation. And in a “Hobson counterfactual” with a large magical income redistribution from savers to consumers, Britain’s capital exports probably would have been reduced. Hobson believed British industry ‘overproduced’ and had to sell the ‘surplus’ abroad, and this was the source of the high savings (high profits). But the reality is that by 1870 (at least) Britain had a deficit every year in the merchandise trade balance. That goes against the stereotype of Victorian Britain as the “workshop of the world”, the titanic manufacturer and exporter who wiped out native industries all across the globe. But the import of food and raw materials consistently exceeded British manufactures exports by quite large amounts. What made up for it was the surplus in the trade of the ‘invisibles’ — the earnings from Britain’s financial, shipping, insuring, and other global services, as well as the profits from its large investments abroad. In fact, these overseas earnings were large enough to finance both the merchandise deficit and the capital needs of the New World. All this implies that after some point “surplus savings” in Europe were generated not through domestic production but through foreign production i.e., returns from cumulative foreign investments made in the past, not because the domestic economy was producing more than it imported. Simply put, GDP < GNP. There were also other structural factors which pushed capital abroad, besides inequality — such as demographics and the ‘stage’ of development. 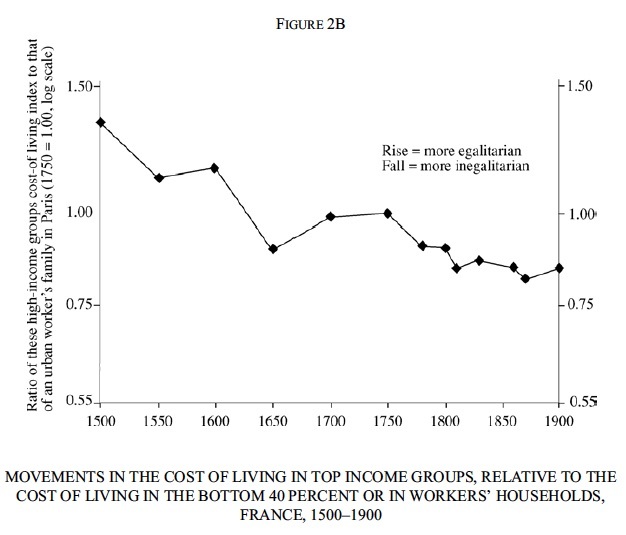 If we go by Piketty’s top incomes data [1, 2, 3, 4, 5], by the early 20th century British inequality was just a little higher than French and German inequality, but the wages of French and German urban unskilled labour were still lower than Britain’s even as late as 1913. Yet France and Germany exported less capital than Britain, with Germany’s foreign investment share of national savings actually trending down (not up) in the 30 years before WW1. More importantly, British and French national savings rates were about the same as American and German, but in domestic investment, UK, France < Germany << USA and the New World in general. Britain was still more developed than France and Germany, and there may have been diminishing returns to capital. This is where Hobson’s difference with Lenin matters. Hobson thought Britain was “capable of indefinite expansion” if only those “surplus savings” would stay home given enough domestic purchasing power. But for Lenin the rates of return were low because British capitalism was in its death throes. My point is that inequality alone cannot explain Europe’s “surplus savings”. International differences in dependency ratios and level of development were also crucial structural factors in addition to income distribution. In fact, Hobson may have overestimated the role of the elites and underestimated what he himself called the “thrifty middle classes”. As part of the same [revisionist] agenda, colonialism has made a comeback, most notably in the works of Niall Ferguson where we learn of “la mission civilisatrice” of England and France and such interesting and false factoids that the British colonized area was a free trade zone, while of course India was forced to sell, in what Paul Bairoch aptly termed “the colonial diktat”, all of its raw materials to the metropolis. The latter was thus a monopsonist. It is indeed easy to pretend that you are a free trader if all that you buy from others is at the discount. Ironically, Hobson himself would have disagreed with Bairoch as described by Milanovic, since he devoted chapter 2 of Imperialism to arguing how useless were the post-1870 colonial acquisitions for expanding British trade. Hobson even argued that you could let China be carved up by the other European powers, and Britain would still benefit from the Chinese market ! At any rate, it’s completely false that India was “forced to sell…all of its raw materials to the metropolis”. Both British India and Egypt (under the British protectorate) exported raw cotton to Britain’s competitors in textile manufacturing such as Germany, France, and later Japan. Japan started industrialisation partly with Indian cotton and, especially after 1918, exported cotton textiles to British India itself. I thought all this was now generally known with that extraordinary piece of imperialist apologia, Sven Beckert’s The Empire of Cotton, which states: “By 1910, only 6 percent of Indian cotton exports went to Great Britain, while Japan consumed 38 percent, and continental Europe 50 percent”. Milanovic does accurately report what Bairoch called the “ideal type” of the colonial trading regime, but he omits some important details. The economic relationship between the imperial metropolis and its colonies was not inscribed in stone by Moses for 500 years, and the 18th century mercantilist stereotype does not fit very well the unusual period in world economic history that was 1870-1914. This is well illustrated by none other than Bairoch himself, who authored the first chapter of the Mathias-Pollard edition of The Cambridge Economic History of Europe, Vol. VIII, (1989) which contains 25 pages of description of colonial trade policies for 1815-1914. 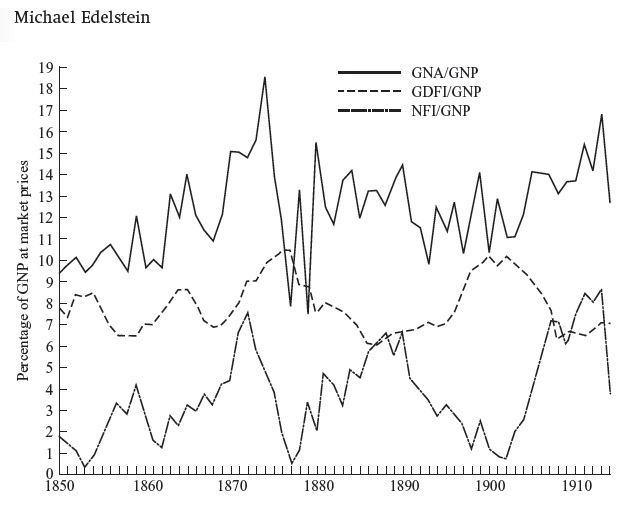 There definitely was an imperial bias in the trade flows of the colonies, relative to a gravity model of trade (although Mitchener & Weidenmier 2008 argues the “empire effect” was a combination of preferences and lower transaction costs). Another reason for the imperial bias was that the government of the colonies was often the purchaser and importer of inputs for the construction of infrastructure. The Government of India built a national railway system ordering only from British suppliers. But it is definitely false, pace Milanovic, that “colonies could trade only with the metropolis”. 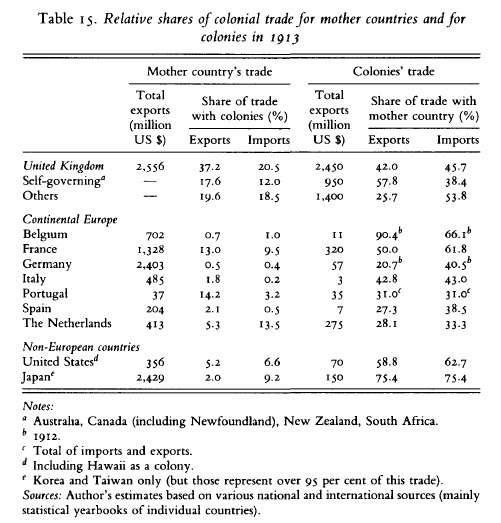 The colonies of the European powers conducted a large fraction of their foreign trade with third countries. Britain in particular did practise — at least after 1849 — free trade with most of its dependent colonies, just as Ferguson said. [“Britain’s policy of free trade meant that there was nothing to prevent German exporters from challenging British firms in imperial markets (and, indeed, in the home market itself)”]. Open door = free trade, or uniform tariff policy for everyone. Assimilated = the colonies were treated as provinces of the metropolis, so the tariff policy for foreign goods was identical for metropolis and colony. Preferential = metropolitan goods were levied zero or nominal tariffs, whereas goods from other countries had higher duties. 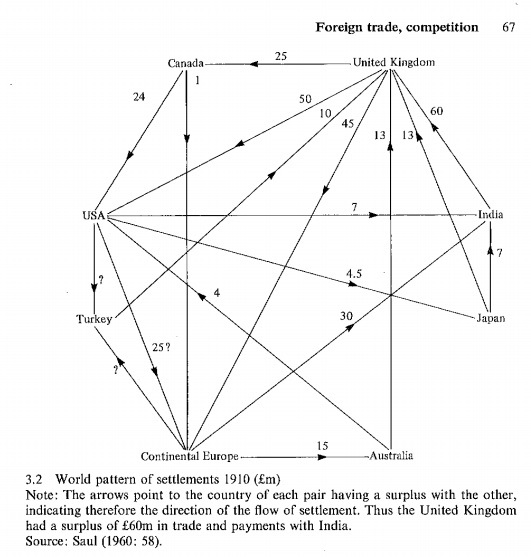 The UK ran large bilateral trade surpluses with India and Australia, which in turn balanced Britain’s deficits with the USA, Canada, and Europe. India settled its deficits with Britain through its surpluses with the United States, Japan, Europe, etc. It’s often asserted, Britain’s maintenance of the classical gold standard relied on its surplus with India; that would not have been possible if India could only trade with Britain ! The economic historiography of the 1870-1914 era is tremendously focused on Europe’s epic movement of capital (and people). But it only makes passing references to the Hobson-Lenin thesis, and usually only to say how implausible it is given the geographical pattern of the capital flows. And it’s true. Colonies may have been acquired and exploited, but they were not the primary destination for the capital exports of the Great Powers. Far from it. The “external investment outlet for the surplus savings” of France and Germany was overwhelmingly Europe, the United States, and Latin America. 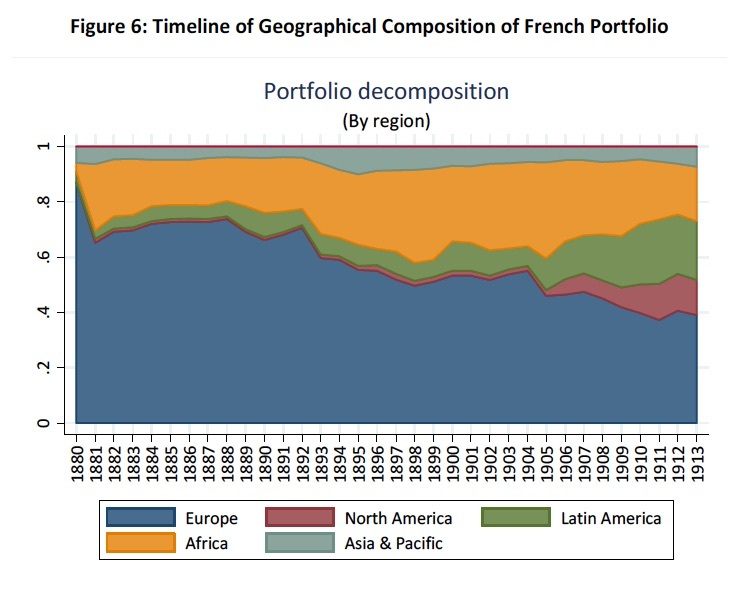 These regions accounted for ~80% of cumulative French and German investments, with Europe dominant. For the UK, less than 20% of the total went to the so-called ‘dependent colonies’, a category which excludes the rich self-governing ‘white dominions’ which are obviously not part of the Global South today. Most of the 80% of British foreign investment took place in North America, Argentina, and Australasia. As you can see from the above, “finding an external investment outlet for the surplus savings” did not require that the Great Powers be “in physical control of a place”, and actually-existed foreign markets for Western capital were profitable without “other possible competitors … excluded even at the cost of a war”. British India even received French and German investment! Much of this capital flowed out of Europe to help build the railways, the ports, the electricity grids, and other high fixed-cost “social overhead” infrastructure of the fast-growing, European-populated frontier economies of the 19th century: North America, Australasia, Argentina-Uruguay, and Russia. These countries, in turn, exported food to Europe. Europe’s capital exports, then, could be viewed as an extension of European direct investment in domestic food production. 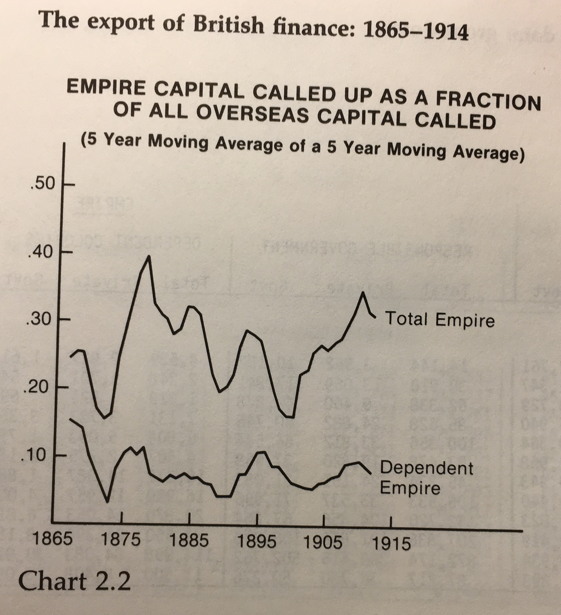 But the preceding are averages and aggregates across time and may miss trends in capital flowing more toward colonies as imperialist competition heated up before WW1. A good Hobsonist-Leninist might ask, were capital flows toward colonies accelerating? The lack of “imperialist competition” for investment markets is obvious once you realise how savings actually got distributed from Europe to the rest of the world. Most European capital exports were portfolio investment in sovereign bonds or equity shares in infrastructure projects which were floated in the financial markets of London, Paris, or Berlin. There was relatively little of what we would call “foreign direct investment”. And given the near-complete capital mobility of the 1870-1914, it does not make sense to say there was competition for investment markets. Much of the ‘British’ foreign investment may actually disguise the foreign investment of France, Germany, and other countries, because the British data are based on London capital calls (Davis & Huttenback; Stone). French and German investors often bought securities in London for projects in the British Empire and the Western Hemisphere. And most of these foreign capital issues were syndicated, meaning the same bonds or shares usually had their initial public offerings in several markets at the same time. If a British bank underwrote a large bond issuance for a rail project across the pampas in Argentina, normal principles of risk management made it seek secondary underwriters or distributors in other markets. French banks worked in the Balkans with German partners; in Greece, the public loans were subscribed by an Anglo-Franco-German association. In Serbia the B.I.O. and the Berliner Handels-Gesellschaft shared business (such as public loans) in 1895. In Bulgaria an international group under the leadership of the Banque Internationale de Paris (B.I.P.) gave 28 percent of its business to Austro-German elements. In 1894 an understanding between German and French banks divided the percentages of Turkish public loans without bidding. The Deutsche Bank and the B.I.O. agreed in 1905 that 25 percent of the contracts concluded by one would be offered to the other. It is not for nothing that this period in world history is often called the “first globalisation”. There truly was global financial integration, and great power rivalries did not necessarily interfere with it. Even instances of imperial gunboat diplomacy and “informal empire” on behalf of bond holders which so exercised Hobson — such as when Napoleon III occupied Mexico partly to collect debt in arrears, or when Germany blockaded Venezuela, or when the British navy shelled Peru for the same reason — served the collective interests of the European investor class in general, not the narrow national interest of the country sending the gunboats. In the case of Russia, which clearly favoured French investors, the cause is obvious and well-documented: the Franco-Russian military alliance starting from the 1890s. Strategic priorities of the state altered the flows of finance; financial needs did not dictate state policy. Finance was forced to serve strategy, not vice-versa. Per Esteves (2011), “African investment [by French investors] is dominated throughout the period by Egypt, but this particular jump [between 1892 and 1900] is two‐thirds explained by the mining boom in South Africa”. For several decades before the Great War, Britain and France were the chief competitors for colonial possessions, and one of the flashpoints after the British semi-annexation of Egypt in 1882 was over the Nilotic region. Anglo-French tensions were so incendiary they almost went to war during the Fashoda incident (1898). Yet here we have French private investment flowing unceasingly, not to France’s own colonies for the most part, but to the British-controlled parts of Africa. We might even call this the “Fashoda Principle”: politico-military rivalry implied very little about commercial rivalry. None of the above denies that great power quarrels in the tropics often involved the financial and commercial interests of a narrow class of Europeans. Countries seeking colonial annexations tended to favour territories where their citizens already had some commercial interests. Some colonial wars were indeed fought, as Hobson argued, on behalf of “sectional interests that usurp control of the national resources and use them for their private gain”. And there were groups in all the belligerant countries who harboured vaguely social-Darwinistic ideas about the need for colonies. But this “crony capitalism” can hardly have been an important cause of the Great War, since “profitable uses for surplus savings outside their own country” were found overwhelmingly not in the tropics, but in the United States, the neo-Britains, and peripheral Europe. Did imperialism help cause the war? Almost every book about the Great War lists, virtually pro forma, colonial competition as one of the background causes of the war. Undeniably it created friction amongst the great powers. But I think it’s fair to say that most 0f the Great War historiography also stress colonial competition had very much abated in the decade before the war, unless you count the Balkans. Ferguson’s The Pity of War has many problems, but one thing he’s very right about is the war that never broke out in the late 19th century between Britain and France, or between Britain and Russia. Anglo-French colonial disputes that lasted for decades had been by far the most heated, and British paranoia about India was continuously incited by Russia’s expansion across Central and East Asia. Yet, annoyingly, the Great Powers kept on resolving colonial disputes peacefully. The Anglo-French competition eventually came to a halt with the Entente, which was aimed squarely at the European situation. The Anglo-Russian tensions over Persia, Central Asia, the Caucasus, and China were set aside in favour of greater cooperation within Europe itself. Even quarrels with Germany were largely resolved by the first decade of the 20th century, e.g., Britain dropped its objections to the Berlin-Baghdad Railway, when Germany agreed Britain could control its eastern terminus (again, that Indian paranoia). The anticipated “scramble for China” ended up as the Yangtze Agreement on the open door policy, perhaps the most pristine example of multilateral “free trade imperialism”, with everyone having access to trading and investing in an unpartitioned but prostrate China. There was — ultimately — just too much European compromise and cooperation in exploiting and carving up the rest of the world. The colonial disputes which Britain took most seriously and was willing to go to war over — Egypt (Fashoda), South Africa (German tensions over Transvaal), Afghanistan (Russian relations) — were all related in some way to monopolising maritime access, and eliminating all traces of threat, to India — the one and only ‘dependent’ colony which was economically important to Britain. But all else in the world, including sharing the spoils of China and the Ottoman Empire, was largely open to negotiation. Except, of course, for the naval rivalry in the North Sea. What actually soured Anglo-German relations was that Germany’s naval programme was perceived as an existential threat to an island trading nation. German dreadnoughts just a “few hours from the English coast” were somewhat more important than Samoa or the Caprivi Strip. IF the naval rivalry was something crucially important to the outbreak of the Great War, then Avner Offer’s The First World War: An Agrarian Interpretation is much more plausible than the Hobson-Lenin thesis. Both Britain, to a great degree, and Germany, to a lesser but significant degree, were dependent on the import of food, and the North Sea was the choke point for Germany. Germany’s motivation would then seem more ‘normal’. After all, the German naval buildup was confined to the North Sea fleet, and it did not seek to match the size of Britain’s navy. So it seems less about Weltmacht than an understandable response for a great power dependent on imports for food and raw materials in a world where war was considered a normal state of affairs. Certainly the naval programme did not imply a luxury comparable with, say, the Soviet navy of the 1970s and 1980s trawling the waters of the South Atlantic or the Indian Ocean. I think that interpretation is most factually consistent with who actually took the decision to go to war in Germany. After all, wars aren’t waged by anonymous ‘deep’ forces. “Structural factors” still require some kind of mechanism exerting pressure on the actual actors. Electoral pressure, domestic interest groups, the colonial lobby, the militarists, whatever. There were few direct links between the various pressure groups and the Reich’s small political and military elite. There is no question that men such as [Chancellor] Bethmann Hollweg and [Chief of the General Staff] Moltke were concerned with the views of public opinion-makers. But there is no evidence to suggest that they at any time during the July Crisis shaped their policies according to the perceived interests of those groups. Neither political leaders, nor eminent bankers, nor captains of heavy industry were consulted in the final considerations for war. Nor were Germany’s [jingoistic] academics, theologians, or veterans groups consulted. I consider that directly contrary to the Hobson-Lenin thesis: the capitalist bourgeoisie did not have the final power in Germany (let alone Austria or Russia). And the small and specific group of decision-makers is identifiable. One of the arguments made by Fritz Fischer in his second book is that Germany had already taken the decision to go to war in 1912, based on a high-level meeting that year which seemed eerily to reflect much of German behaviour in July 1914. Even if that interpretation is rejected, it’s still telling that only the military and the Kaiser were represented at the meeting, with no civilian government figures like the Chancellor or the Foreign Minister involved. In all three Germany, Austria, and Russia, a feudal-agrarian-military elite governed over an increasingly bourgeois-industrial society (but especially in Germany). Those decision-makers held the unilateral power to go to war. And they took the decision unaccountably. When it came to matters of war, it’s not even clear that the East-Elbian Prussian Junker class really cared about the opinions of the country’s industrial and banking magnates. The Hobson-Lenin theory is weak on the facts. Imperialism hardly required “surplus savings” in the first place. In historical context, income distribution was an ambiguous factor in Europe’s capital flows. Colonial outlets were not necessary for the surplus savings of the European powers. The European Great Powers generally did not compete for investment outlets. The Great War was not supported by financial interests or triggered by imperialist rivalry over colonies. [ Update 6 Dec. 2017: Thomas Hauner, Branko Milanovic, and Suresh Naidu have a new paper out, “Inequality, Foreign Investment, and Imperialism“. It’s an excellent defense of the Hobson-Lenin thesis which finally restates it in quantitative terms. (a) Let’s set aside for a moment that most foreign investments by the great powers did not take place in their formal colonies. Let’s also forget that the belligerents did not deny to one another their formal colonies as investment outlets. But even the informal imperialism à la Gallagher-Robinson was exercised as an inter-imperialist public good. Informal imperialism was not a zero-sum affair. Formal colonies like India, or informal colonies like Egypt, or a “zone of influence” like Argentina, were available to all foreign investors. (b) As I argued in the main text, informal imperialism was a de facto multilateral enforcement of the pre-war international financial system. European gunboats compelling Turkey or Venezuela to continue making payments to European bond holders, or European officials taking direct control of Chinese or Ottoman customs, maintained an international system of finance. Historian Jamie Martin has written about how the “structural adjustment programme” in Austria in 1921-22 was intended to formalise that haphazard pre-war system. (c) The inequality=>war hypothesis requires that imperialism cause tensions between the great powers over commercial opportunities. But the imperialists ended up being too cooperative about their carve-up of the world! That’s what the “open door policy” for China illustrates, as I argued in the text above. That’s also what the two Moroccan crises also illustrate. By sending a gunboat to Agadir, Germany was not trying to deny France the control of Morocco. Germany was demanding a quid pro quo: if France was going to expand in North Africa, Germany should also get something. You can think of it as extending the Congress of Vienna to the whole world, as a recognition of the multilateral European dominion over the world, but with Germany having more relative standing than it had done as Prussia in 1815. (d) Therefore, even conceding that inequality did cause foreign investment in formal and informal colonies, the Hobson-Lenin theory’s empirical connection with the war is still weak. As I said in main body of the post, there are 4-5 intermediate steps connecting domestic inequality with the actual war. Each step has some grain of truth but the steps are weakly connected with one another. But even if we accept all the intermediate steps, the final step (imperialist rivalry=>war) is actually the most dubious. One must posit “deep social forces” that decision-makers weren’t really conscious of. In one-off events like the Great War the historian’s instinct to examine the actors’ motives in the archives is more useful than assembling data. The historical record can sustain the view that the colonialism-imperialism that truly mattered was German ambitions in the East (as well as Hapsburg ambitions in the Balkans) which were clearly blocked by the Russian empire. But the historical record is not consistent with the leaders of the belligerents going to war out of some imperialist rivalry over the non-European world. This entry was posted in Branko Milanovic, Foreign Investment, Inequality, the First Globalization, The First World War and tagged and the first world war, Branko Milanovic, capital exports, colonialism, endogenous world war 1, Hobson, Hobson-Lenin Thesis, imperialism, inequality, Lenin, The Great War, underconsumption. Bookmark the permalink. Great post – really enjoyed it, and agree completely. This is a very good post. I recall reading Lenin’s Imperialism, The Highest Stage of Capitalism in John Mearsheimer’s course War and the Nation State in 1984. Mearsheimer went through the book then rebutted it, showing that Lenin was wrong on the facts. He concluded that the book was a smash success as propaganda and a complete failure as a factual explanatory model. In fact, Lenin had it backward. The capitalists generally were terrified of war, and it was the atavistic leaders of agrarian states, or regions of states, who thought they could come out ahead by going to war. As an aside, Norman Angell was right that war was madness and would ruin everybody and nobody would win. He was only wrong in thinking that political leaders would understand this and act accordingly. Avner Offer’s book is good at showing the extreme security risk the British took by permitting themselves to rely on overseas food imports. The British were status quo players and only a threat to their survival could have pushed them to war. Germany, unfortunately, chose to make that threat with the construction of the High Seas Fleet, a contender for worst strategic decision of all time. Even the details of Britain’s decision for turn on this naval security issue. Belgium was created by Britain expressly to neutralize the possible invasion staging areas for an attack on Britain. Keeping this area out of German hands was the goal, and the general claim of defending the rights of small countries was not entirely cynical, but was mostly a moral gloss on a hard security concern. One of the great might-have-beens is if Kaiser Wilhelm, or someone else on the throne, had been a wiser man, and if Germany and Britain had struck some kind of grand bargain circa 1890, and used all that steel that went into German dreadnoughts for something else, like railways in the Ukraine and all the way to Baku, and points further East. Britain would have guaranteed the safety of German shipping, Germany would have a free hand in Eastern Europe — something like that. A much better 20th Century can be glimpsed. Alas, no, though a good alternative history SF novel could be written by someone with the requisite time and talent … . Really great post! I think I was a Hobsonist-Luxemburgist re WWI before coming to this post but I think you’ve convinced me that the causes of WWI aren’t so simple. In particular, your arguments and evidence in points 4 and 5 seem to invalidate the Luxemburg-Lenin interpretation of the causes of WWI. However, I’m not convinced that income “maldistribution” was not a contributing factor at all to imperialism more generally. 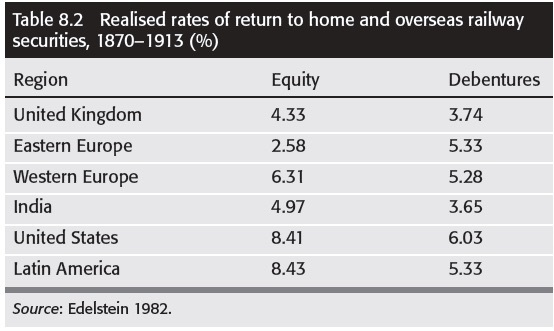 If you interpret the Hobson-Luxemburg thesis from a “classical” perspective, then the low rates of return domestically were brought about by excess saving AND investment, because in the “classical” theories saving CAUSES investment. If that’s how you interpret Hobson-Luxemburg, then your arguments in part 1 are pretty conclusive in rebutting them. However, as noted by Dr Michell, if we accept Keynes’ critique of Hobson and then reintepret Hobson in Keynes’ terms (which is what Keynes then proceeded to do in the GT), then we arrive at another interpretation of the link between income maldistribution and imperialism (we can also look to Kalecki’s complementary interpretation of Luxemburg to the same effect). Milanovic alludes to the Keynesian interpretation when he notes that income maldistribution was linked to “insufficient domestic aggregate demand”. The low rate of return was not a consequence of too much domestic investment with diminishing marginal productivity of capital. Instead, it may have been linked to lower rates of utilisation of the metropolis’ capital stock, brought about by insufficient consumption expenditure. It would therefore be possible for a country to be both a capital importer and have “surplus savings” if the term “surplus savings” is interpreted to mean that there is insufficient aggregate demand to keep the utilisation of the capital stock at such a rate that the profitability goals of firms are being realised. Under this interpretation, imperialism could potentially resolve the problem of chronic aggregate demand deficiency in two ways: (1) through increased government expenditure on military campaigns and occupation; and (2) by improving the trade balance. Of course (2) was not always realised for the imperial powers, but even the expectation that imperialist expansion would improve the trade balance and profitability would be sufficient to justify imperialist policies. Britain in particular may have been running large trade deficits in and before the 1850s, but (unfortunately I’m only a hack historian, so I could be wrong, in which case sorry…) I heard that this was largely driven by large imbalances vis-a-vis Qing China, whose isolationist policy led to a balance of payments problem for the tea-thirsty British. And of course this led to more imperialist wars. There is possibly a third, and somewhat tenuous link between income maldistribution and imperialism. If imperialism causes increased specialisation for the metropolis and the periphery, in manufactures and raw materials, respectively, then this may lead to a virtuous circle of investment and productivity growth in the metropolis that resolves the problem of insufficient aggregate demand through the Kaldor-Verdoorn effect. This is putting a Kaldorian spin on this already very (heterodox-) Keynesian story, but nevertheless if technological improvements are embodied in investments in new capital stock in the manufacturing industry, and if these technological improvements facilitate higher rates of investment, then the income maldistribution effect on aggregate demand may be offset by the specialisation effects of imperialism. All of this is not to say that these concerns about aggregate demand were in the minds of imperial powers when they were making policy and deciding to invade/punish/colonise peripheral nations. The problem of income maldistribution probably could’ve been resolved in many ways other than imperialism. But under the Keynesian interpretation of Hobson-Luxemburg, it just so happened that imperialism was (one of) the solution(s) to the problem of maldistribution, and at the time it seemed to work, so the imperialists carried on invading/punishing/colonising. Really interesting post. I have a few observations on the first part of the post and on the first of your five points. I’m not informed enough to comment on the other points, but I’m interested to see Milanovic’s response. My intention isn’t to defend the imperialism thesis per se, but to highlight some issues I have with your argument. I don’t read the Luxemburg-Hobson-Lenin theory as stating either that imperialism requires surplus savings or that foreign investment requires imperialism. As you say, the US is deficit nation. But I think 21st century US imperialism is a very different beast to that of pre-WWI period, and so one can’t generalise simply on the basis of ‘imperialism’. The broad point made by the three authors – in quite different ways – is that excess saving (an excess of production or production capacity relative to consumption) has the potential to cause problems. One cause of excess saving is an unequal distribution of income because the rich tend to save more than the poor. One ‘solution’ to these problems is for savings to make their way overseas – and one mechanism by which this can occur is down the barrel of a gun. In other words, nations can forcibly open up new outlets for investment through colonialism and imperialism. This is my reading of the Hobson version. Luxemburg and Lenin’s Marxism adds another dimension to their telling of the tale (Hobson was no Marxist). For Luxemburg, it is not the nation state which is unable to absorb the surplus created, but capitalism itself: for capitalism to survive and expand without crisis, it needs to continually open up new non-capitalist or pre-capitalist societies into which it can expand. So I think your point about gross capital flows is incorrect. In either the Hobson or the Luxemburg-Lenin versions, the problem is an excess of output over expenditure or, equivalently, an excess of saving over investment. This is a net concept: the difference between domestic saving and investment for any nation is identically equality to the foreign balance. So an excess of domestic savings does require net capital flows, not just gross flows. Keynes criticism of Hobson, as I pointed out Twitter, was that Hobson assumed that excess saving (i.e. not-consuming) would automatically lead to excess (i.e. unwanted and therefore unprofitable) investment. A central message of the General Theory is that business investment and consumption decisions are made by two separate groups of people and, as a result, that the rate of interest does not act to bring saving and investment into equilibrium: Keynes assumes saving is unaffected by the rate of interest while investment is affected both by the rate of interest and by expectations which tend to be unstable. So I don’t think Keynes missed the point – although his theory was set in the short run, he thought that unemployment equilibrium could persist pretty much indefinitely. Keynes’ theory can be extended to the long run without significant alteration. Keynes’ argument also applied in an international setting, as discussed by Skidelsky: http://www.skidelskyr.com/site/article/keynes-hobson-marx/. In an open economy setting, as with the closed economy case, Hobson’s assumption that higher saving (lower consumption) would lead to greater capital accumulation is false. The citizens of one nation can lend to the citizens of another nation without an increase in capital accumulation in the debtor nation taking place – or even without any transfer of goods, i.e. with no change in net exports. A range of mechanisms can be identified by which this could happen: accommodating gold or reserve flows, currency intervention, exchange rate movements and so on. So, as you say, in a Keynesian system and assuming different propensities to consume of the poor and the rich, higher inequality will, ceteris paribus, lead to higher desired savings. In reality saving and investment must, by definition, be equal, so realised domestic savings will depend on the level of investment and cross-border lending that takes place. You are right to question the ceteris paribus assumption, but I’m not convinced all your points are correct. The first issue you highlight is that higher consumption would lead to higher imports and lower net exports. But this doesn’t undermine the Hobson thesis: all else equal, lower net exports will also mean diminished requirements for foreign lending – and it is the need for foreign lending which drives imperialism for Hobson. The second issue is more tricky, but doesn’t immediately undermine the theory, at least in the Marxist Luxemburg-Lenin version. This is because it is capitalism itself, not ‘Great Britain’ which is unable to absorb its own surplus and must therefore expand. This version of the theory would therefore predict that eventually, capitalism would develop in the newly opened territories, leading to the same problem of a surplus that cannot be absorbed. In non-Marxist, Hobson terms, this would manifest as foreign investments, previously undertaken to provide a ‘vent for surplus’, eventually generating income which can likewise no longer be absorbed. This is a classic Marxist contradiction: the ‘solution’ to the problem turns out to make the problem worse in the long run. So the fact that the surplus savings are eventually generated overseas doesn’t, I don’t think, undermine the logic of the argument. What does seem to be problematic is the evidence that the UK was a net importer of manufactured goods well in advance of the outbreak of war. Does all this still matter? I think it does because the problems of excess saving leading either to domestic unemployment or ‘global imbalances’ is very much still with us. These kind of dynamics were central to the breakdown of the eurozone and to the build up of Chinese surpluses and US-UK deficits which remain with us. It also relates to issues around sovereign debt and deficits. As Gaffers notes, Kalecki’s solution to the Luxemburg problem was for governments to run deficits equal to the excess of desired saving over investment. These ‘internal exports’ would offset the deflationary effect of insufficient aggregate demand. With respect to McCloskey’s remark, I can’t help noting that today there are indeed two Forth Bridges (and a third under construction at Queensferry). There’s also a line of the Overground which tracks the route of the Bakerloo line very closely. One point on this inequality = ‘surplus’ savings idea. The best thing for profitable (an adjective which itself begs the question of where such profits arise if their clentele are so straitened) business men to do is not to invest in backward colonies, but to increase via domestic investment the wealth, sophistication & productive capacities ( hence the consumptive wherewithal) of ( less impoverished/relatively rich) customers at home. As you rightly emphasize, it is not a zero sum game even if Kalecki-type timeless macro-accounting can make it appear so. Both the premise for the analysis and (consequentially) the conclusion are really quite silly. Of course its real intent is to let capitalism off the hook. As with libertarian ideology, capitalism is never to blame. Just ask Hillary Clinton and Tony Blair! Arno Mayer made the case some time ago for the political and indeed general social dominance of the traditional landlord aristocracy throughout “Old Europe” on the basis of their social monopoly of landed property, in The Persistence of the Old Regime: Europe to the Great War. Yet in no way could this 19th century landlord aristocracy be socially characterized as a “feudal-agrarian-military elite”! The impact of the French Revolution drove the old aristocracy well onto the “capitalist road” and these aristocracies had all adapted to capitalism both in agricultural production and in finance. Their condition was that they remain the dominant force in politics, and that they hold a monopoly of military power. That was the deal the Frankfurt liberals accepted after the suppression of the 1848 revolutions. So of course this now bourgeoisified landlord aristocracy was the proximate cause of the First World War. But Germany’s naval buildup was undoubtedly a great source of profits for the industrial capitalists who supplied this demand. The archaic political structures of Europe no doubt produced the “derangement” of capitalist development in a militarist direction. But this was a political pact the European capitalists deliberately and knowingly entered into, especially after 1848. They could have alternatively continued the bourgeois revolution, the bloc with the masses. We all know they chose a counter-revolutionary course instead throughout the 19th century, one key reason why that century was relatively “quiet” for Europe. Finally, setting up economic reductionist straw men to knock down is quite old hat by now. Even Althusser, for all his faults, pointed out 50 years ago that there is no direct mapping of economic processes to concrete political events, and that non-economic social phenomena posses their own “laws of motion”. But there is a rational relation to be deduced between the economic and non-economic, and attempts to fog over any possible relation is simply an exercise in libertarian-style social irrationalism. So yes, the European capitalist class bears its full responsibility for the onset of the war – both wars. If they were so against it, why didn’t they try to stop the rush to war? For that matter, so to were (likely) a majority of the working classes of Europe, and certainly their political leaderships. If the German SDP would not oppose the war, why would anyone expect the bourgeois liberals to speak up. Or perhaps, had the liberals spoke up, the SDP would have followed. And so on with France and Britain, in the latter where it was the reform liberals that led the war effort!!! H. H. Asquith and David Lloyd George, how much more bourgeois can you get! In particular, the whole argument could be quite different if one was to see the Western parts of Russia (today’s Poland and Ukraine) as colonies. This is of course debatable (Lenin and Luxemburg disagreed on that point) but at least to some extent acceptable. If we turn to your five points focussing solely on this part of the world what do we find? 1.Does the maldistribution of income explain European capital exports ? This is clearly the weakest part of the Hobsen-Lenin chain, but three things can be said here in its defense. First Germany, unlike England is at the time very much an up and coming industrial nation. Second, the relationship between German investment banks and German industry is famously strong so the link between finance and factories is easier to make. Finally, third and most importantly there is the issue of “Great Russian” investments in Poland/Ukraine which were massive, some 80% of the local gentry’s estate being taken over after 1861 along with many crucial assets (factories, mines, trains, banks). One can only wonder what exactly the Prussian Junkers may have done had they been in charge of the region, but here there seems to be some relationship between inequality and investment in the Russian case. Not in the case of Russia. When the gates of the east closed c. 1880, Germany’s exports towards its main trade partner were divided by two. True, the exclusion of German goods from Russia were never total but the tariff barrier was very significant. The Ukraine specially was bleed dry by Russian industrial cartels benefitting from the protection of tariffs. If Russian investment to Ukraine/Poland was to be included and parts of Russia, Austria and the Ottoman empire relocated to the Empire section, numbers would be quite different. Maybe not staggeringly so but different enough. There was, plenty of it. France and Germany were jockeying one another for the opportunity to invest in Russia, Russia prevented German investment from happening, so in this region of the world there was significant competition. Commenter Gaffers suggested that low aggregate demand due to inequality might have lowered the domestic rate of return for British and European investors. That’s an empirical question, but I’m sceptical there could have been so much underutilisation of productive capacity as implied by that suggestion. The swings in the investment cycle were largely driven by differences between domestic and foreign rates of return. Sometimes there would be a big overseas investment boom (in North America, especially), but when overseas rates of return fell, British savings “stayed home”. But what was the balance of the push and pull factors ? The United States and Latin America offered pretty high rates of return. The gap with the UK (as a long-run average) seems just too large to make ‘domestic underconsumption’ a an important explanation. The first issue you highlight is that higher consumption [due to a hypothetical income redistribution from British savers to British consumers] would lead to higher imports and lower net exports. But this doesn’t undermine the Hobson thesis: all else equal, lower net exports will also mean diminished requirements for foreign lending…. My observation about extra import demand is connected to the subsequent observation that Britain (as well as, later on, France and Germany) were not trade surplus countries in terms of physical goods. Rather, their current account surpluses were driven by the so-called ‘invisibles’, what today we would call the balance of trade in services and net foreign factor income (NFFI). In other words, Britain, France, and Germany were not producing more (physical goods) than they were consuming at home. I think this is a problem for any variant of the Hobson-Lenin thesis — if the source of your “excess savings” is actually overseas, and not domestic. Another issue is the composition of the merchandise trade balance and the pattern of trade which is neglected by purely macroeconomic reasoning about external balances. Britain exported manufactures, and imported food and raw materials. The “Hobson counterfactual” (a large income redistribution from savers to consumers) would have required more food for any year we might be talking about. But earlier the counterfactual begins, the more the pattern of British specialisation would have been altered. A portion of any extra food demand would have been met by imports, but a portion would have been met through domestic production. Britain’s actual food import requirement was pretty hefty. In 1850, ~25% of calories available per capita were imported, and by 1913 it was <60%. And that’s just the average: lower down the income distribution, caloric consumption would have been lower and the activity level (from unskilled labour) would have been much higher compared to today’s energy requirement. Both — structural transformation and terms-of-trade improvement — surely had welfare-improving effects in the long run, even holding politics and institutions constant. I’m not arguing that such secondary effects would have been large enough to offset the effects of direct redistribution of income from savers to consumers in the “Hobson counterfactual”. Surely the direct effect would predominate. But…. The tendency for domestic production would have been reinforced if the Corn Laws had never been repealed and Britain had continued to protect its agriculture after the 1840s. And I venture to guess, politically, Britain would have stayed protectionist, had it been a more egalitarian country in terms of wealth and asset distribution. There’s no mystery about why Germany stayed protectionist: despite its powerful industrialists, Germany was politically controlled by an agrarian-military elite of “East Elbian” Prussian Junkers. Democratic France pandered to the agricultural interest, because the land reforms of the French Revolution had divided up the great aristocratic estates and created a large class of small land holders. In the long run, this may have slowed industrialisation in France, since, even as late as 1945, France was much more agricultural than the UK or Germany. In plutocratic Britain, the distributive political conflict was between the ascendant northern manufacturers and the traditional landed aristocracy. The aristocracy lost this conflict, and the value of agricultural land slowly eroded over time. But to some extent the agrarian interest was compensated because the landed magnates integrated socially and economically with the global services industry based in the City. Had Britain been a more democratic country in the 18th and early 19th centuries, and a more egalitarian country in terms of land holdings, the balance of political power might have favoured the agricultural interest. 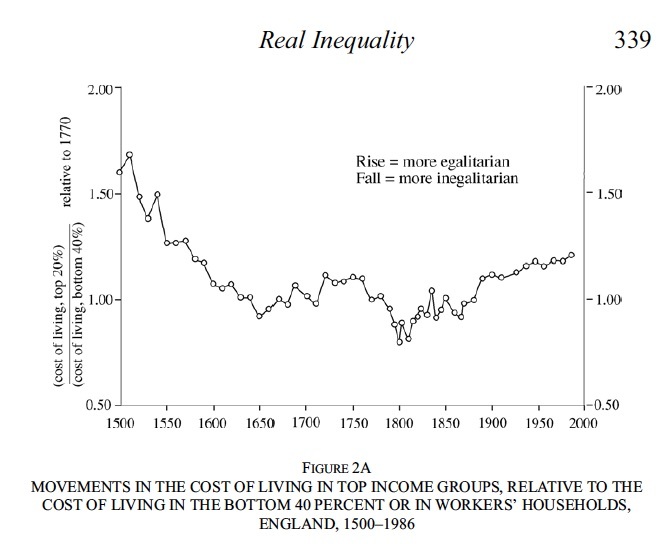 Then we can take much more seriously the idea that greater equality (earlier in the 19th century) might have retarded Britain’s subsequent development. In the long run, British and European capital exports financed the development of the food exporting sectors of North America, Australasia, Argentina/Uruguay, and Russia-Ukraine. The incredibly cheap food from these sources, as we know from Hoffman et al. (2002), helped lower inequality after 1870 in Europe. Between 1867 and 1910, the cost of living for the bottom 40% of the British population fell nearly 25% on account of lower food prices from agricultural globalisation. European capital exports, then, should be viewed as an extension of European direct investment in domestic food production. Not having net exports of capital would have slowed down the development of the settler frontiers and checked one of the great equality-promoting forces of the late 19th century. And remember, the capital-importing / food-exporting economies of the 19th century were populated by European migrants. British exports of capital and people look almost synchronous in the time series ! Basically it amounts to this: Northwest Europe’s specialisation in manufacturing entailed a dependence on imported food and raw materials. Demography and industrialisation had produced by mid-century a large supply of young footloose urban workers. In parallel, there were large land-abundant settler-frontiers with a scarcity of labour and capital, high dependency ratios, and a potential for huge agricultural and raw material production. The “first globalisation” connected the two processes — European workers emigrated en masse and European capital chased them en masse. As O’Rourke & Williamson (1999) argue, Europe’s capital exports “during the age of high imperialism can be viewed, at least partially, as an intergenerational transfer” amongst Europeans. 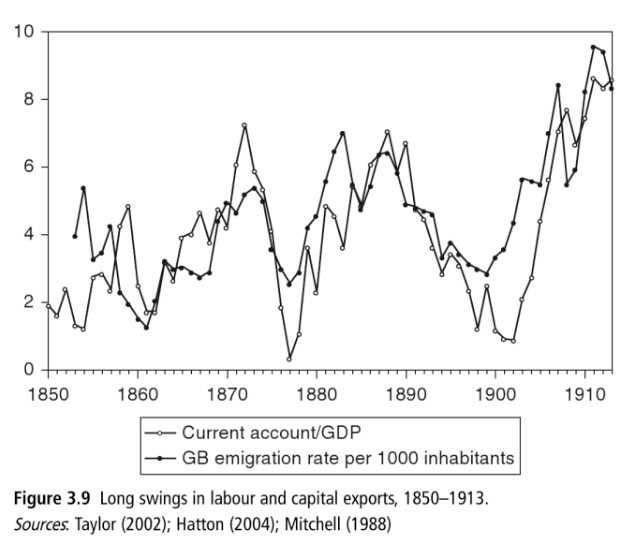 Hatton & Williamson (1998), probably the most comprehensive treatment of the economics of mass migration in 1870-1914, finds that along with demographics (as an independent variable), the most important factor explaining emigration was the gap in real wages between sending and receiving countries. So we might speculate, if there had been less inequality in Europe on the eve of the Great War, not only would there have been less capital export, but also fewer people exported. Yet people exports were important in the long run to the development of Europe’s egalitarian and social democratic institutions. 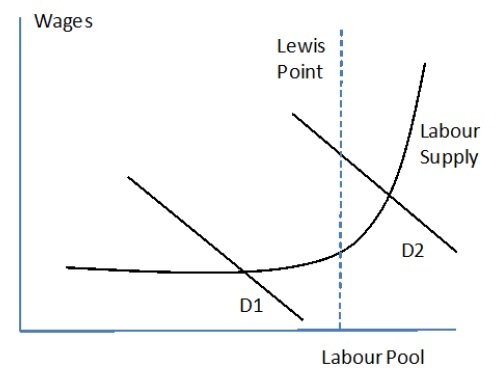 One simple way of conceptualising the path of income inequality in the course of industrialisation is the Lewis Turning Point, named after the development economist and Nobelist Arthur Lewis. In the early stages of industrialisation, because agriculture is becoming less important as an employer, there is urban-rural migration and the supply of workers rises faster than the urban demand for workers especially in manufacturing. The Lewis turning point is where migration into the cities decelerates, and employers start bidding up wages, as labour bargaining power is strengthened. (It’s basically the point where the labour supply curve switches from being horizontal to ‘normal’ and upward-sloping.) Before the LTP, wages grow more slowly than labour productivity, and the labour share of income falls; after the LTP, wages grow at the same rate as labour productivity and the labour share rises. Emigration helped accelerate the coming of the Lewis Turning Point in 1870-1914, especially for Sweden, Norway, Italy, and Ireland, where emigration really thinned the ranks of labour. Emigration may also have contributed to egalitarian institutions more indirectly. Recent evidence from Sweden suggests that having an “exit option” via emigration emboldened labour activists in the period 1867-1920 and ultimately increased membership in trades unions. Since labour agitation carried the risk of sacking, intimidation, and blacklisting, the option to emigrate reduced the cost of social activism. Scandinavia’s famous social democracy was made possible, at least in part, by emigration — or rather the “first globalisation”. The overall point I’m trying to make is that even if inequality drove the export of capital and people, the latter two also contributed to lowering inequality in the long run through the development of the neo-Europes and the relief of demographic pressure in old Europe. useful, thanks, and consistent with our view of what’s going on leading up to 1914. But c) doesn’t deal with our argument. We say inequality -> foreign investment -> militarization. Not necessarily war, but expanded and powerful armies and navies make every other conflict turn into war more easily. The gunboats that secure bondholder repayments are easily redeployed for other purposes. We differ from the classic view in imputing imperial rivalries as the source of the tensions driving WW1, and perhaps we should stress this more. I think the disagreements re: colonies were there but very sporadic (e.g. fluctuating British loyalties pre 1910, race to Fashoda) and, as you note, as likely to turn to cooperation as conflict. Instead, we think that in the absence of e.g. a NATO-like org, a high capital account deficit (held by the rich) generated incentives to maintain high degree of national military power and a willingness to use it (or inability to commit to not use it). That’s the COW military personnel + Piketty net foreign assets correlation in the last section, and its surprising to us that the economic history space hasn’t pointed out the link between 19th century globalization and build up of military power (besides Avner Offer). Any source of tension, whether personal (e.g. paranoia of the Kaiser), imperial, continental, or continental imperial (e.g. Balkans, Western Russia, Dardanelles), would be more likely to turn into war in the presence of hypertrophied armed forces. Thanks for the comment! I did notice the militarisation-increased-the-risk-of-war view. I may expand my comments from above and in that case I would address the militarisation point specifically. Following up my blog post on the subject, I’m sharing this excellent rebuttal of the Hobson-Lenin thesis.